In late May Copenhagen hosts a large beer festival. In 2011 Mikkeller and Three Floyds collaborated on a couple of events to coincide with this festival. One was the dedication of most of the Mikkeller bar’s guest taps to beers from Three Floyds. This in itself is an exceptional event as the products of the brewery that ratebeer.com considers the best in the world are rarely available far from Chicago. The night before this tap takeover was an extraordinary collaborative dinner. The venue was Mielcke & Hurtigkarl, an impressively elegant dining venue on the grounds of the Royal Danish Garden Society. Planning had been going on (and the event had been sold out) for months. 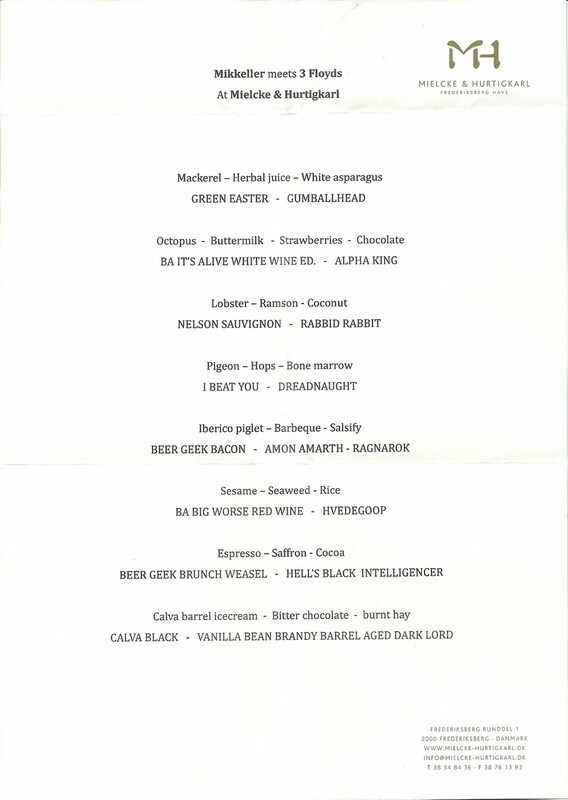 Eight courses had been devised to go with eight pairs of beers – one each from Mikkeller and Three Floyds. Mikkel of Mikkeller, Barnaby Struve of Three Floyds and Jakob Mielcke of Mielcke & Hurtigkarl were on hand to introduce each course. 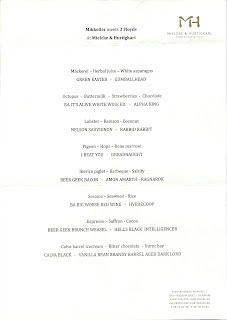 A scan of the menu is attached, although the names of the dishes are somewhat terse. Interestingly of eight courses, three were seafood, three incorporated ice cream and the other two were based around pigeon and pork. None used red meat. If I tried to pick a few highlights I would end up picking something from just about every course. Every dish was delicious and was at least a respectable match for the beers. For a few the lexicon of superlatives would be getting exhaustive use. Perhaps the biggest highlight wasn’t on the menu - before formal dining started there was a chance to sample a brand new beer, created by Mikkeller especially for the restaurant. It was an 8.7% Belgian-style pale ale aged in barrels that previously contained Chateau d’Yquem – the world’s most famous dessert wine. It changed my view of what barrel aging can do for a beer, staying light and refreshing but still incredibly complex. Of the beers, only a handful of the Mikkellers have made it to New Zealand so far (Nelson Sauvignon and Beer Geek Brunch Weasel) and none of the Three Floyds, although the Hvedegoop (Wheat Wine) is in the same series as the Oatgoop and Ruggoop that Hashigo Zake has a few of. The event kicked off at 6pm and at around midnight that guests settled themselves into taxis, with about half of them going back to the Mikkeller bar for a bonus fourth dessert. It’s hard to believe that a beer geek could have a better six hours. The whole menu sounds delicious up to the last food item: burnt hay!? Really?